A large shrub, in the south sometimes almost treelike. Leaves evergreen, thick, oblong, oblong-lanceolate or oblanceolate, dark green on both sides, sharply pointed at the apex, usually narrowed toward the base, 4 to 8 inches long, 1 to 2k inches wide, drooping in winter. Flowers large, several or many from a scaly conelike bud forming a dense inflorescence or cluster. Pedicels sticky-pubescent; corolla 11/2 to 2 inches broad, about 1 inch long, rather deeply five-cleft into oval obtuse lobes, rose color varying to white, with yellowish or orange spots within. Fruit a small capsule about two-thirds of an inch long. In low woods and along streams, Nova Scotia, Quebec, Ontario and Ohio to Georgia and Alabama. In New York State rather local in distribution. The Lapland Rose Bay (Rhododendron lapponicum Linnaeus) is a low, depressed or prostrate shrub less than 1 foot high, with small purple flowers about three-fourths of an inch broad. It is found only on the highest summits of the Adirondack mountains, and in alpine and subarctic regions of both hemispheres. 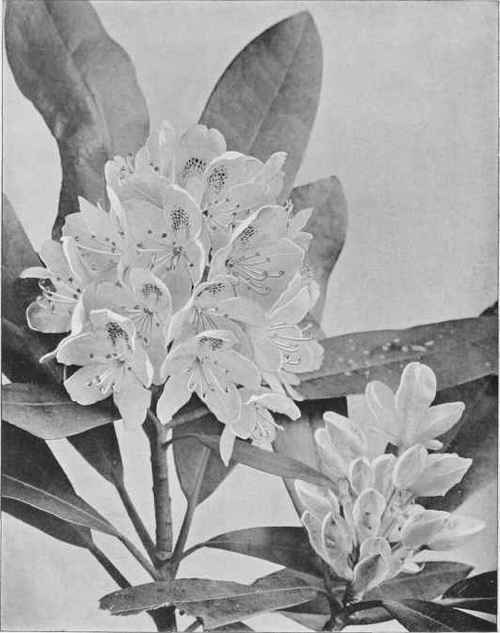 The Rhodora (Rhodora canadensis Linnaeus) is closely allied to the Rhododendrons. It is a small shrub, 1 to 5 feet high. The flowers appear with or before the leaves, rose-purple in color; the corolla about an inch broad, the lower lip of the corolla divided into two linear-oblong, obtuse segments. In bogs and on wet slopes, Newfoundland to New Jersey, west to Quebec, central New York and Pennsylvania.